Cursed: Is Good Luck in the Cards for the Rangers? Some day, when I am old and gray and nodding by the fire, as Mr. Yeats put it, I hope I will finally come to understand life’s mysteries. Life’s mysteries are many and they are indeed mysterious. For example, I never will understand why the first people who picked lima beans continued, having first eaten them, to insist to their fellow Mesoamerican sodbusters that lima beans are actually food. (It is this that makes me doubt the whole Mayan apocalypse business, which is actually comforting. I don’t think they knew what they were talking about.) Lima beans taste like sand. And I never will understand why people bestir themselves in the hot summer sun to come out to football training camps. I do not care what anyone says, football training camps are the hottest places on earth. Once, over the course of a couple of years, I spent 13 days watching soccer in Qatar — this was back before we turned the place into an aircraft carrier — and then three days watching the Dallas Cowboys train in Wichita Falls, Texas, which I believe once was part of Oklahoma but got too hot and melted its way through the state’s southern border, finally puddling itself up north of Dallas. Wichita Falls felt hotter and more unpleasant than Qatar was. In Qatar, at midday, when the temperature went into triple digits, everything stopped for a few hours. In Wichita Falls, when that happened, everybody stood in front of cooling fans, ate ice cream bars very quickly, and watched linemen lean on each other until somebody fired off an air horn, whereupon everyone walked around until they found another place to lean on each other. It was like watching sumo wrestling in hell. That is the other thing I don’t understand. If you watch training camp — or, in fact, any NFL practice — you very rarely get to see anyone actually play football. Go to an NBA practice, and there’s at least the possibility that you’ll see the team scrimmage. At training camp, though, if you’re really lucky, and the day is really electric, you might get to see some passing drills where somebody throws the ball and somebody runs downfield and catches it. Occasionally, there is a defensive back or two involved. If someone catches the ball, everybody cheers and marches happily on toward heatstroke. New England Patriots coach Bill Belichick once told me that, when he played lacrosse in high school, he used to love practice because, at practice, you actually got to play lacrosse, which is sort of the point of the whole deal. We were talking at that point about getting players motivated for practice during the 11th or 12th week of an NFL season. “I don’t know if any player really likes coming to football practice,” Belichick mused. And Belichick presides over one of the most spectacularly successful training camps in the league with regard to having people come to watch his players lean on each other. I remember reading not long ago that 4,000 people came out to watch Peyton Manning’s first practice in Denver. This was said to be unprecedented in Denver, and I can almost see why it happened. People wanted to come out and see actual physical proof that the Broncos now had a Hall of Fame quarterback and that, therefore, nobody in Denver had to argue about Tim Tebow anymore. Well, the Patriots laugh at your 4,000 people. They regularly put more than double that into their complex on a summer’s day and, since their football operation is now next to an upscale suburban shopping mall, you can come to Foxborough and watch your heroes lean on each other, buy some expensive lingerie, eat a massively overpriced burger that costs as much as the lingerie did, see a movie in a theater where you have your own waitperson, and drop by the Patriots Hall of Fame. When it comes to self-memorialization, those Mayans who first ate lima beans had nothing on the Kraft family. This place is going to mystify future archaeologists who will dig it up and wonder who this Hawg Hannah deity was. In other words, there’s a lot to do besides watch training camp, which was probably the idea in the first place, but, nevertheless, they pack them in here, day after scorching day, and everybody seems to be having a good time, which is one of life’s mysteries that I hope to understand one day. For me — pale, easily sunburned, possessed of an inbred Celtic suspicion of the great yellow ball of pain in the sky — training camp always has been about the people who get all sweaty and lean on each other. This is where the stories start, in football’s great meteorological conundrum. You waste yourselves in the summer heat so that you can summon something up when it’s third-and-4 in the dead of winter. There are people who have put themselves through this for more than a decade — Tom Brady is now one of those people — and there are people who are putting themselves through it for the first time, like Chandler Jones, a rookie defensive lineman from Syracuse who has been the unquestioned find of New England’s camp so far. In New England’s first exhibition game, against New Orleans on Thursday, Jones played so well that veteran Saints tackle Jermon Bushrod told reporters Jones reminded him of Jason Pierre-Paul, the New York Giants defensive end who had a breakout season last year. Bushrod picked up two holding calls — both of them dubious whistles from scab referees. Thanks, Rog. — trying to contain Jones. His is today’s story, because training camp is all about people and their stories, unless you want to talk about blocking schemes in the middle of August. Jones was one of the last ones off the field Monday, smiling in the middle of a media scrum, long trickles of sweat running down his face and cascading off his chin. “It’s been great,” he said. “I’ve been enjoying it.” And, oddly enough, you believe him. I don’t even want to think about what the living room must have looked like. Jones is one of three brothers. One of the brothers, Arthur, now plays defensive line for the Baltimore Ravens, who the Patriots play early this season. The other one, Jon, is the light-heavyweight champion of the UFC and a genuine star in the universe of mixed martial arts. They grew up in upstate New York, sons of a preacher and a woman who worked with the disabled, the three brothers caring for a beloved older sister named Carmen, who was slowly dying with cancer in her brain. 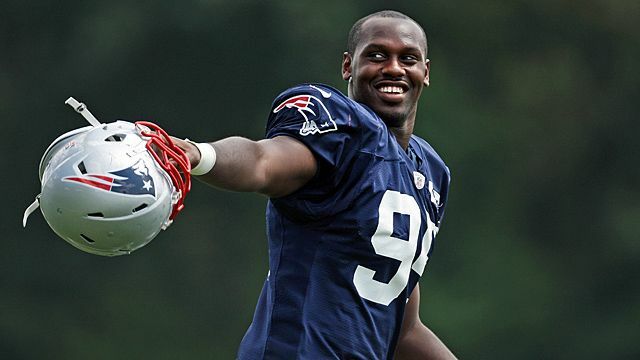 If anyone ever earned his place in the unblinking sun, Chandler Jones has. So, at the very least, the Rosetta Stone course in fluent Belichickian is coming along very well. Last season, the New England defense was marginally adequate, but there were long stretches, like the end of the Super Bowl, where they couldn’t make enough plays to get off the field. More to the point, their personnel was not suited to the kind of mad-scientist thinking that Belichick first developed in New York, when he had Lawrence Taylor as the primary catalyst for his experimentation. The object in this year’s draft was to give him that kind of flexibility again. That resulted in the selection of Jones, and of linebacker Dont’a Hightower of Alabama. Against New Orleans, Jones went to the head of that class. In addition to working well against Bushrod, Jones managed to pressure the Saints quarterbacks five times, including one moment in which he seemed ready to drop Bushrod in Drew Brees’s lap. He’s an intriguing physical specimen, 6-foot-5 and 260 pounds, long and leanish, the way Pierre-Paul is, strong enough to hold the edge against the rush and yet tall and agile enough to make plays against the pass from the defensive line. “When I bat the ball down, I look at that as a good play,” he said. “If I don’t make it to the quarterback, and he’s throwing it short, I throw my hands in the air and, if I bat it, that’s a good play. “I come out every day and try to work on my craft and work on my moves, whether it’s speed or if it’s power, so I can take what the offensive line gives me. And thus is one of the mysteries of life solved, at least for the moment. Somebody enjoys coming to training camp. Life is a constant quest for knowledge, and I’m learning new things every day.